So, this is a giveaway from our catering menu….but we love you guys and totally want you to rock the Thanksgiving table this year (for those of you who actually celebrate the American holiday, tee-hee…but hey, don’t we all have something to be thankful for?)! So, for those of you who are still creating a menu and doing your shopping, this recipe will knock everyone’s socks clean off! 🙂 And, it’s simple!!! Wahoo!!! Actually, this was already a copycat recipe that I created after stopping off at a New Frontiers, a whole food market, on my way down to LA for the holidays last year. It was mounded high in their deli case and they were passing out samples. It was to die for! So, frugal me refused to buy a pint and instead, recreated it the next day for our Thanksgiving Day menu….and it’s so darn good that we added it to Zest it Up‘s catering menu. Yum! 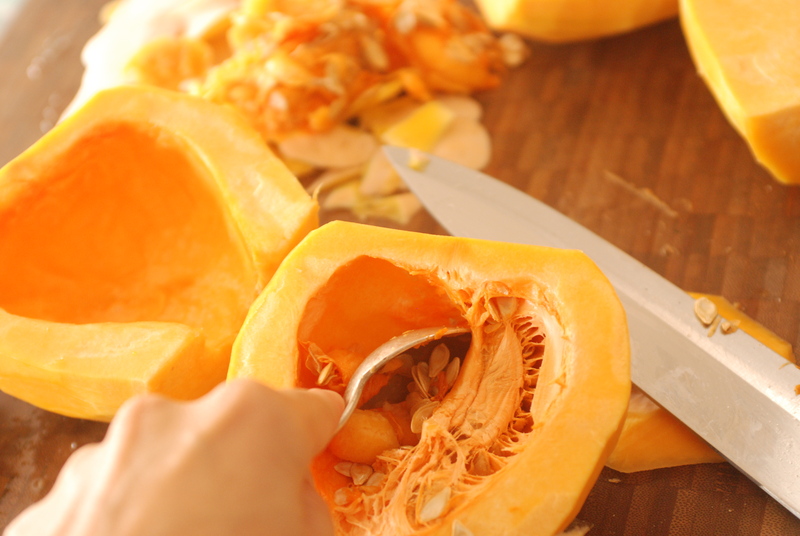 Grab a butternut squash and a sharp knife! 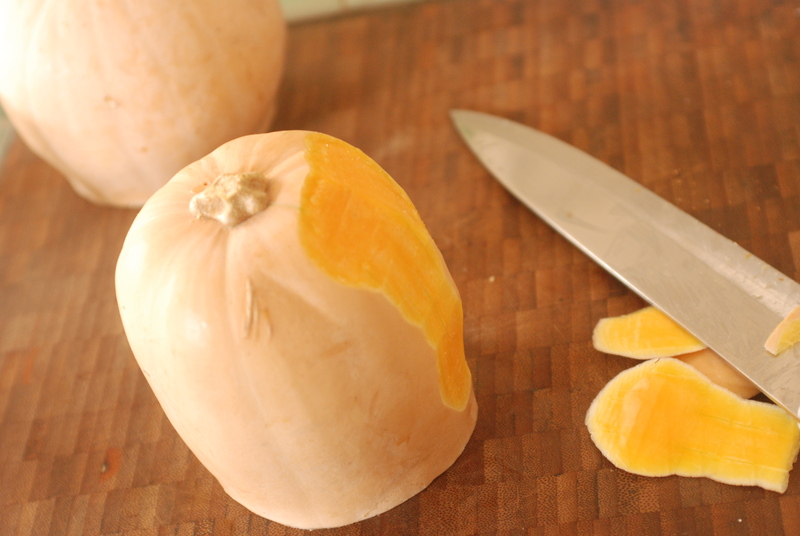 After you have hacked it in half, turn it on it’s flat side and run you knife down, taking the peel clean off. The important step is to cut it into nice 1/2 inch cubes that will brown nicely and be a good bite. 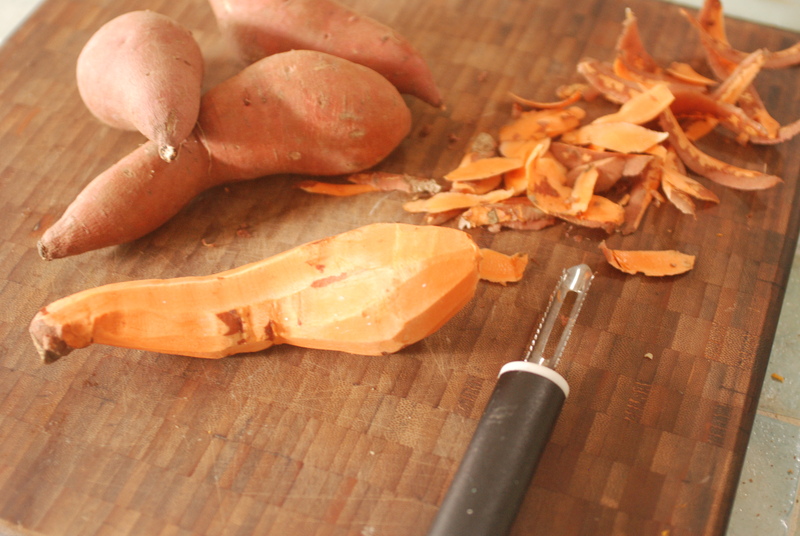 Now, do the same thing with your sweet potatoes. 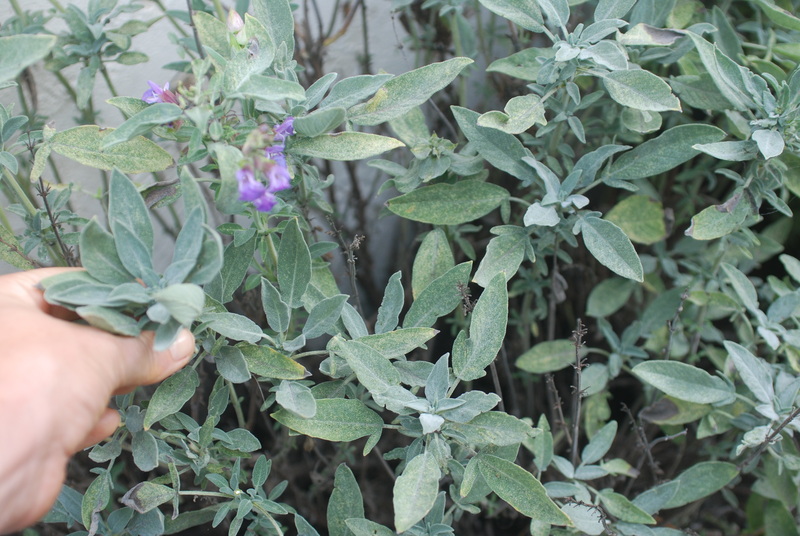 Out to the garden for some fresh sage. One decent size pack from the store would work, but I gathered a nice sized bunch to chop (sans bugs…wash, wash, wash). 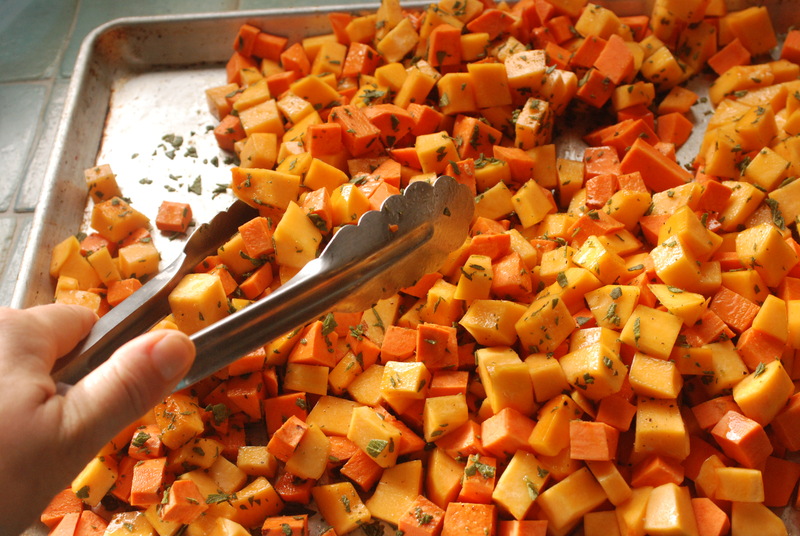 Add some salt, pepper and the chopped sage to your squash and sweet potatoes. Drizzle with olive oil and toss. 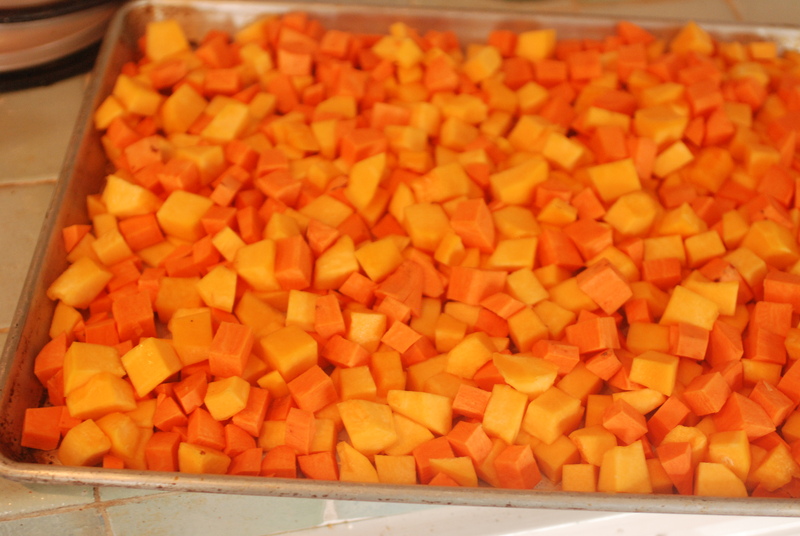 Bake at 425*….super hot so the outsides get crisp and the insides soften and sweeten. Check on your dish after 20 minutes…you may need a another 10 or 20 minutes, but give it a toss before you add any more time. Once it looks gorgeous, transfer carefully and then add in your cranberries and nuts….haha, I usually do walnuts, but my mom happily reminded me of my sister’s adult onset allergy to walnuts, no bueno. So, I’m substituting with pecans..which she loves. This dish is so gorgeous and soooo delish! Definitely not one to relegate strictly to the holidays. And it’s so great to have a gluten-free, vegan recipe in your back pocket. Hope you get a chance to enjoy this one sometime this season. Probably the most important step in this recipe is the oven temperature, set it at 425*. 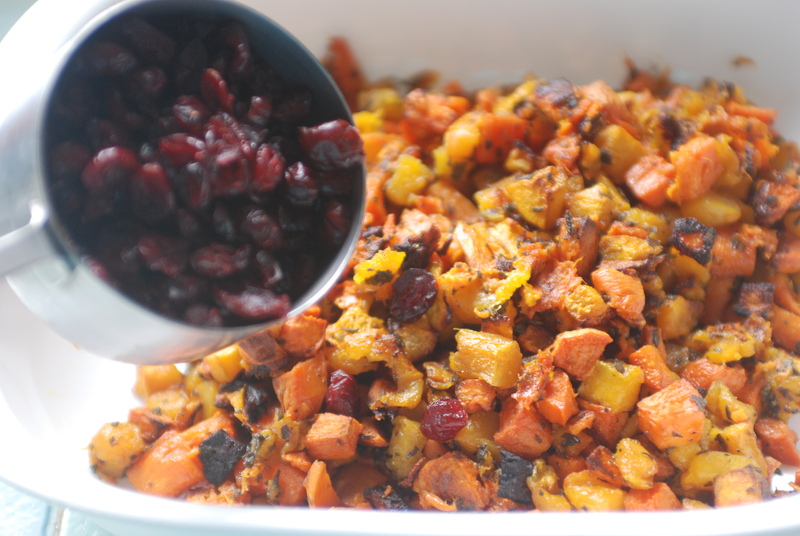 The high temperature will allow your sweet potatoes to cook through quickly while crisping their exteriors nicely….if your oven is cooler, you will wind up with baby-food mash when you go to toss is your cranberries and nuts. 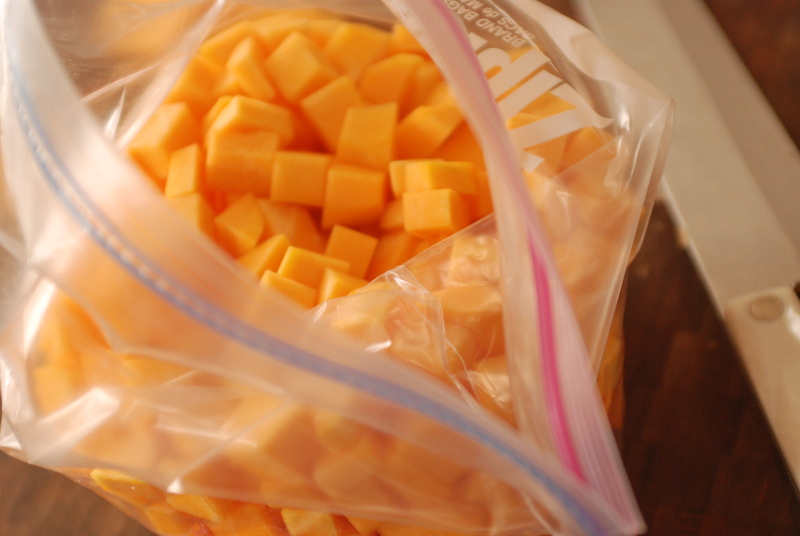 Now that I’ve got that off my chest, peel your butternut squash and sweet potatoes and cube them into 1/2 inch pieces. 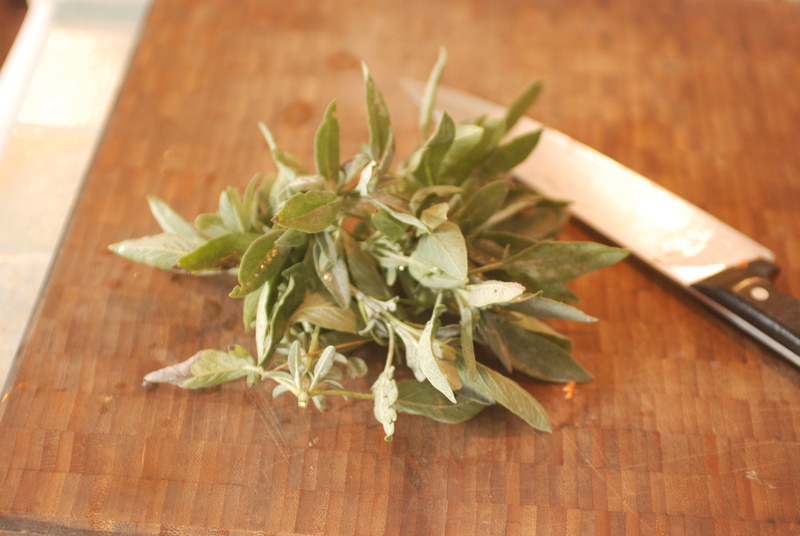 Put them on a cookie sheet, drizzle two tablespoons of olive oil on them and toss with the salt, pepper, and the sage. Cook, checking at 20 minutes. Once they are caramelized and crisped on the outside, take them out and gingerly dish them out into a bowl. 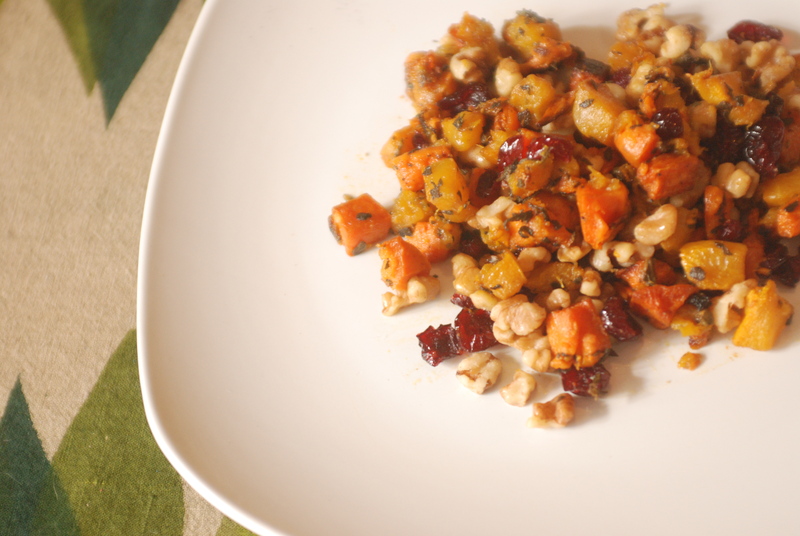 Add in your cranberries and nuts, then toss. If it needs an extra drizzle of olive oil, go for it! Serve it warm or room temperature. Yummy, hardy and sweet!